Samsung has been busy this month with special events to showcase its new products ,as first at the beginning of September they took to stage in Berlin to unveil some new hardware, and now today it has revealed that the Galaxy Note 10.1 2014 will release in India but there is currently no price. Earlier today we brought you the news of the pricing and availability of the Samsung Galaxy Note 3 for India, and now we also have news that the new version of the Galaxy Note 10.1 will be released in the country during October. The release was officially confirmed by the company but details about how much it will be costing consumers in the country were left out. The version of the Note 10.1 2014 that will be arriving in India will feature the Samsung Exynos 5 Octa processor running at 1.9GHz for both the 3G and Wi-Fi only versions. This is coupled with 3GB of RAM and will come running the Android 4.3 Jelly Bean operating system, and as the name suggests the device uses a 10.1-inch Super Clear LCD display at a resolution of 2560 x 1600 . There is also an 8-megapixel rear facing camera while around the front is a 2-megapixel unit for video calls and self portraits, and supplying the juice is an 8,220 mAh battery. The tablet PC will come in 16GB, 32GB, and 64GB storage options that can be expanded by another 64GB via microSD card, and also has improved S Pen functionality. 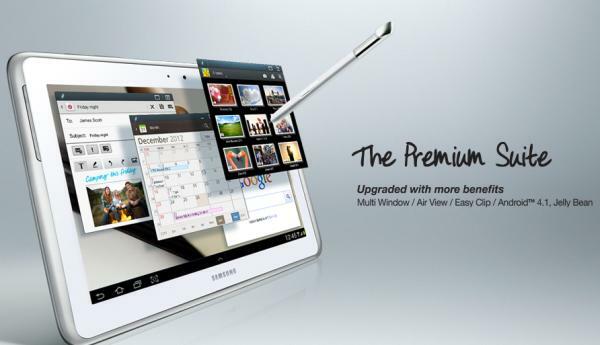 Do you like the look of the new Samsung Galaxy Note 10.1? “Do you like the look of the new Samsung Galaxy Note 10.1?” fail. It looks the same bro. The image is of the old note. The new note is completely different with a leather back, smaller bezels, slightly smaller and different contours. Yep. The ONLY problem with the first Note 10.1 was the lousy screen resolution. This looks amazing to me. It’s RGBW pentile. So you are only looking at two subpixels per pixel instead of 3. The effective subpixel resolution is 2080×1300 roughly. I’m hoping it still looks good but I don’t expect it to be quite as sharp as the Nexus 10. I’m also hoping the artifacts created by pentile aren’t noticeable at such a high resolution. Nobody has mentioned it in a hands-on so that is a good sign. The pic shown is the older note. The new one has no speakers in the front and a home button that hopefully gets rid of the on screen buttons along the bottom of the screen.